last week my two little babes and i headed to the mall to in search of a magical item. i have been in this blah phase - call it the winter slump - and desperately needed something to pull me out of that rabbit hole. after perusing Nordstrom's latest spring arrivals, i came across a pair of cat-eye Kate Spade sunglasses that transformed me. you know the feeling, whether it's new lipstick or new shoes, every so often there is one item that makes you feel luminous. for me, it was the Kate Spade cat-eye sunglasses. 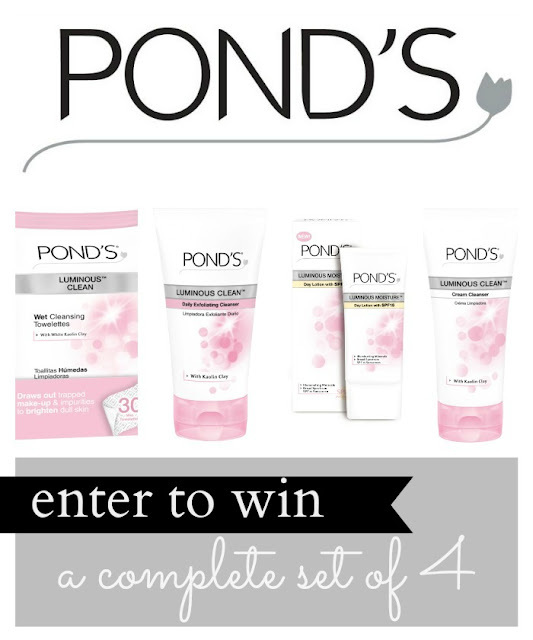 POND’S® has introduced the POND’S® 30-Day Luminous Photo Challenge. from March 4 through April 2, women can upload pictures to the POND’S® Facebook page or share via Twitter or Instagram by using the hashtag #LuminousEffect. thirty prizes will be awarded so that women can live life more luminously. visit POND’S® on Facebook to enter the “POND’S 30-Day Luminous Photo Challenge,” get tips on how to look luminous from Molly Sims, and to join the beauty conversation. to kick off the challenge i was sent POND’S® Luminous Line (as pictured above) to try out. included are Wet Cleansing Towelettes, moisturizer and a collection of cleansers that will help to brighten dull skin. my favorite product of the pack would be the Wet Cleansing Towelettes, i can never seem to get enough of those! and while some work better than others, these towelettes do the job well and you can't beat the price. they can be found at mass retailers for the suggested retail price of $4.99-$5.49. the POND’S® Luminous Moisture™ Day Lotion with SPF 15 is a wonderful moisturizing option as it is lightweight but provides protection from skin-damaging rays. you know i am all about SPF and the easiest way to make sure you don't forget is to purchase a moisturizer with SPF built in. I participated in this sponsored campaign for One2One Network. I received product to facilitate my post and monetary compensation, but all opinions stated are my own. I love Pond's. Everything they produce is great.